Customers can gain tremendous advantages from Oracle's integrated hardware and software stack that includes Oracle’s optimized storage platforms, which have been engineered to work together with Oracle Database to optimize overall system and application performance. Competitive storage systems lack integration with the application software, so they do not have the capability to deliver the performance and cost savings that can be achieved with an optimized environment from Oracle. 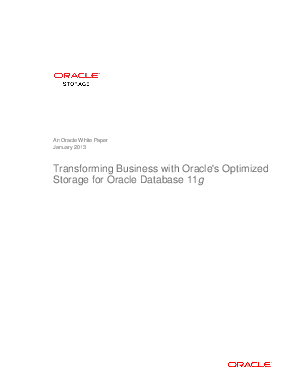 This white paper provides an overview of how Oracle’s optimized storage enables business transformation while saving up to 40 percent on storage costs and lowering risk for deployments.